Do you often wonder “how does a capacitor work”? At least I asked myself that many times when I was younger. I never really liked the “physics explanation”. It states something like “a capacitor works by storing energy electrostatically in an electric field”. I don’t know about you, but that sentence didn’t make me any wiser when I was starting out with electronics. 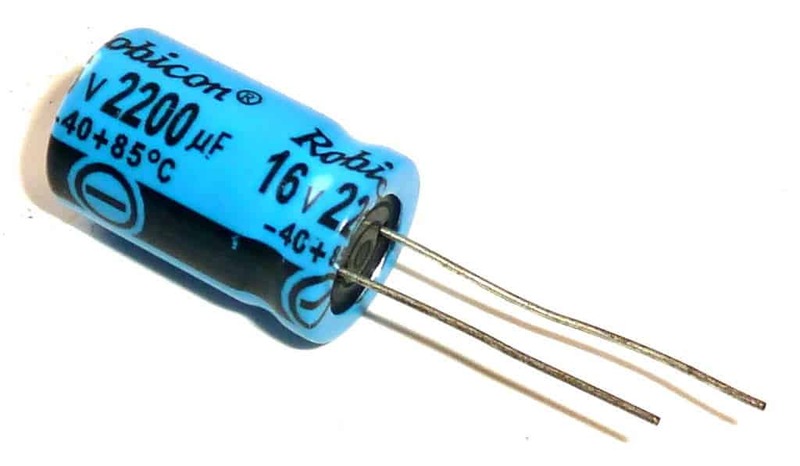 I like to answer the question of “how does a capacitor work?” by saying that a capacitor works like a tiny rechargeable battery with very very very low capacity. The time it takes to discharge a capacitor is usually only a split second. And so is the time to recharge it. So the capacitor can store charge. And it can release the charge when needed. But how does it do this? How does a capacitor work on a deeper level? A capacitor is made up of two metallic plates. With a dielectric material in between the plates. 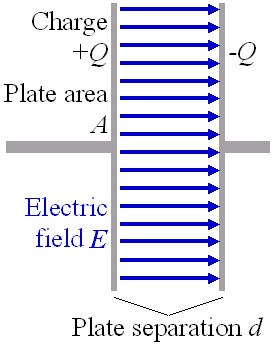 When you apply a voltage over the two plates, an electric field is created. Positive charge will collect on one plate and negative charge on the other. And this is what the physicists mean when they say that “a capacitor works by storing energy electrostatically in an electric field”. There are many different capacitor types. A capacitor is commonly used for filtering. But what is filtering? Let’s look at an example with a battery. 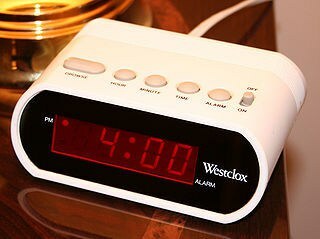 Many alarm clocks are powered by the electrical outlet on the wall in a house. Sometimes, the power goes down. Most alarm clocks have a backup battery that will take over and power the alarm clock until the power comes back on so that the time is not reset. Well, in electronic circuits capacitors can be used in the same way. 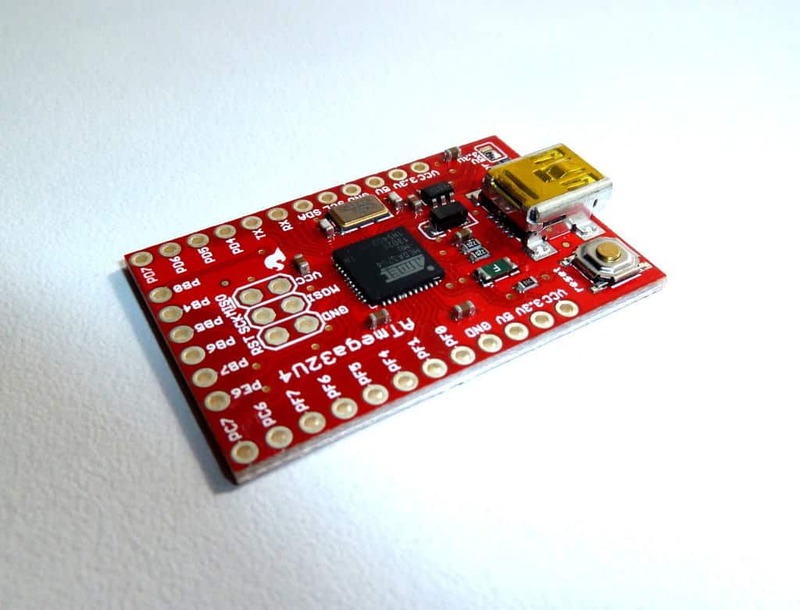 For example if you have a circuit with a microcontroller running some kind of program. If the voltage for the microcontroller drops for only a split second, the microcontroller restarts. And you don’t want this. By using a capacitor, the capacitor can supply power for the microcontroller in the split second that the voltage drops so that the microcontroller doesn’t restart. This way it will filter out the “noise” on the power line. This type of filtering is called “decoupling”. And a capacitor used for that purpose is called a “decoupling capacitor”. It’s also called a “bypass capacitor”. You can also combine capacitors and resistors to form filters that target specific frequencies. For example in an audio system you can target the high frequencies to remove them (e.g. in a sub-woofer). This is called a low-pass filter. When the capacitor is charging, current will run through it until it is charged. When it is fully charged, no more current will flow in that direction. So with DC, a current will flow until the capacitor is charged. Then no more. But with AC the capacitor gets charged and discharged all the time, so that the current can flow back and forth through the capacitor. Yep, that is correct :) Connected in series, the capacitor will block DC and let AC pass. What happens when it is connected in parallel to the ac source? The capacitor will let AC flow to ground while not affecting the DC voltage except during the initial charge. You are correct The AC passing is frequency dependent..The DC “seems” to pass only at initial charging. So Capacitor is more like a battery of cellphone. Charging into DC. after fully charge , flow of current stops? Battery as AC will continually output of current to the cellphone and discharging current. I hope i will be find more $more knowledge from you.please Give me more knowledge about the electronice beacuse i want it.Thanks for all this things. Thanks a lot Mr. Oyvind for these info. May I ask how can radio reception in a solar home system be rectified. The reception is so bad unlike when connected to the grid. Thanks. Hey, Hi ! I just want to ask how to select the values of resistor & capacitor to make a low pass, high pass frequency or a band pass filter….i have a enough knowledge of electronics components individually but how to club them together to make a circuit of interest….when to connect which component ?? these questions always get a place in my mind every time…. If you want to make a super simple and basic filter you only need one resistor and one capacitor for either a low-pass or high-pass filter. For a band-pass filter you can connect a low pass and a high-pass filter in cascade. i am interested in energy storage. What are the best capacitors able to store and for how long? Mr Admin I need all your e-books for free, can you help me. I would be grateful to you forever. High regards to your good self and commendable efforts in imparting knowledge in others. First, kindly send me your e-book “Creating Cheap Circuit Boards” as a subscriber of your newsletter. Second, is it possible to have the following books purchased in e-book format; either pdf or other format. Hey, the free ebook is in the first email you recieve after confirming your subscription. Check your spam folder if you can’t find it. The books you are looking for – I recommend you go to amazon.com and see if they have them. I don’t. Is there a way that i can use capasitors to cut out volt drop to the motors [in series or parr]? In theory that should work, but you would probably need some really big capacitors. I haven’t worked with those kinds of things, so I would advice you to talk to someone who has done it before. I have a quick couple of question here. Why a capacitor is used in a ceiling fan? And what is the source to charge a capacitor? Is it AC or DC source? 1. There are so many ways a capacitor could be used in a ceiling fan, so it’s hard ti answer that. The way I think of a capacitor or an inductor is that I think of them as tanks in a water system. A capacitor is a ‘tank’ for voltage. So, if there is less or no voltage in the circuit the capacitor ‘tank’ will supply it until it is completely drained. Similarly, an inductor is a ‘tank’ for current. So, if there is less or no current in the circuit the inductor ‘tank’ will supply it until it is completely drained. After a water stoppage in a water system, if you are connected directly to the pipe from the water company, you will have water pouring out immediately from the faucet when the water supply is resumed. On the other hand, if you have a tank you will not get water from the faucet until the tank is filled first. The presence of a tank will cause a delay in getting the water out of the faucet after a water stoppage. The addition of a tank may have the advantage of continuous supply in the case of water stoppage but it will also carry with it the phenomenon of delay. If you carry the example of the tank in the previous paragraph to electric components, the capacitor (which is a voltage ‘tank’) will cause a delay in the presence of voltage in a circuit. The volt will lag as a result and the current will lead. Similarly, the inductor (which is a current ‘tank’) will cause a delay in the presence of current in a circuit. The current will lag as a result and the voltage will lead. Thanks for adding your understanding as a comment! I’m working on a project, what is the difference between a Ceramic Capacitor and Electrolytic Capacitor. Pros and Cons of both? hi…!!! frd..i could nt how to make any circuit, and cocept..pls help how to understand…still i dnt get clear concept about circuit and devices…can give any idea??? Hi, if you apply 1 volt over the capacitor, the capacitor will only have 1 volt. 1. Learn how the capacitor works (by reading this article). 2. Figure out some use case in the mobile phone where a capacitor is used, and explain it without using complex words. How does the capacitor work? It is possible to discharge when charging in progress? Or it will only discharge when fully charge? It can discharge at any time as long as the conditions for discharging are there. Hello Dr. Oyvind, and thank you so much for sharing your knowledge with us. I am a DIY audio effects builder, mainly to use in my guitar playing. Up to now I simply copied circuits on the net, but I’d like to go a bit further in understanding. My first obstacle is … a capacitor! I found out that, in the effects I build, the input signal (from my guitar) goes to a capacitor, and from there to the rest of the circuit. Shouldn’t this be insulating the input? What’s the point in putting a capacitor in series with the input, before going to transistors, op amp’s etc.? A capacitor in series on the input will only let ac signals through. So if you for example connected a battery directly to the input, it would be ignored by the rest of the circuit. I want to know that in the complex circuit -full of component- the capacitor can be used to store charge from man DC battery, then capacitor supply another part of circuit permanently? i mean when capacitor charged by main DC power can simultaneously supply another circuit or another part? The capacitor is either charging or discharging. It can’t do both at the same time. Hi ,nice explanation for capacitors but i don’t understand how the capacitor discharges ,in mostof the circuits we connect the connect capacitor in between the ckt then, how will the electrons collected in positive plate will reach the negative plate when there is no dielectric in between. For example, yu can connect a battery directly to the capacitor and it will charge pretty fast. To discharge it, connect for example a resistor between the two pins of the capacitor and the electrons will flow through the resistor (or any other electronic circuit). Do capacitors fail, and how can you test them, or check them??? Hey, yes they do fail. But how to test them I don’t know. Maybe with a multimeter with capacitor measurement function . what is the uses of capacitor in circuit of heartpace maker , radiation detecting device . electronic filter? Yes could be. A capacitor is used for many things within one circuit. Hi, please could you tell me if there are different types of capacitor that allow for different lengths of time for the discharge of the energy, what I trying very poorly to ask is, can you get some capacitors that will discharge in milliseconds and others that discharge in seconds and if so what is the maximum length of time they can they take to discharge. Yes you can. The capacitance value of a capacitor will determine this. Can u tell me please when to use electrolytic capacitor and when to ceramic(polarityless) capacitor? I have had a look and a read of your posts, i am unable to find what im looking for, I have a 47000uf 40 vdc capacitor that is fed from a 24v dc supply, it is used as a smoothing capacitor i believe, it is then in parallel to a set of batteries that are being charged from it and is used to drive a 24v dc motor back and forth, the problem i have is that the capacitor has gone faulty and has increased the output to 36 volts. i need to change the capacitor but unsure if i need the same size or could i use a smaller uf rating? I take it that the 40v dc is its max working voltage? Yes you are right. The 40V is the max voltage. Yeh! man I have learnt a lot from the video clip “How to work a capacitor” . If your answer is only for smoothing the circuit or about high pass , low pass; please I want to know about high pass and low pass circuit. I shall by highly grateful to you. so You didn’t say why we use capacitors, ? Hi, sorry I have never heard about that method, so I can’t help. I would be making an educated guess at why caps are used in a ceiling fan and I think it has to do with the use of a dimmer switch on the fan motor / light fixture. Dropping the voltage via a dimmer switch, on light bulbs makes them dim. This is called a potentiometer. If you do the same thing to the fan motor and drop the available voltage, this causes current to go up (voltage and current are inversely proportionate to each other). This in turn will cause the fan motor to hum very loudly and would eventually burn out the fan motors windings. You can install capacitors and resistors into the fan itsef to turn the potntiometer effect into a rheostat effect. Now, the current goes down instead of the voltage and the fan slows silently in cadance with the dimming light kit on the ceiling fan. How capacitance is appeared by dielectric? u have provided about capacitors. thank u for this inform. if a dielectric material is in between the two plates of a capacitor than how current passes through it? I wish to create an AC to DC converter, 100~240VAC input, 24VDC output & 5A. From electronic book, it mentioned converting from AC to DC by using Full Wave Rectifier, but that cannot fit to what I need. Let say I design a circuit according to input 110VAC and I can get 24VDC output, but when I change the input to 230VAC, the output VDC also vary. Please can you guide me how to create a constant 24VDC output with 5A, regardless of the input supply? In AC circuits capacitors are often used as filters. why are we putting screens with capacitor in a current transformers? how does capacitor divide the voltage or current in a 132kv transformers? What could be happen when pass minimum volt over the capasitor???? If you put more voltage than the minimum voltage, the capacitor could break. 1 microfarad is too little to see the delay. In the video I used 2200 microfarad. What If we use a conductive dielectric material in the capacitor for AC supply? The current that will through it will be the displacement current?? This is such a great explanation on the basics of capacitors. I really like your video example showing how a capacitor acts as a “local storage” element that will charge up in the presence of a voltage, and will discharge when that voltage is removed. What a great way to illustrate that with a LED. And of course, given how a capacitor works, it makes total sense to use them for decoupling and filtering. Great Video, thanks. I am an amature model rocketer getting back into the hobby after a 40 year hiatus and want to build a firing circuit that amplifies the 12v dc energy into a momentary surge or pulse that will ignite multiple engine clusters (if you’re familiar with the hobby) and send the model rocket skyward. Basicly you are heating up nichrome wire with resistance to generate a spark to ignite the propellant in solid fuel model rocket motors. With multiple motors you have a significant voltage drop across the circuit so the possibility of a misfire is high. I figure that if the amperage is boosted with the help of a capacitor this will solve the problem Thanks! Cool project! You should post a video when you’re ready. You did an excellent job of teaching what a capacitor is and how it works. You physical explanation was great and understandable for those of us who are visual learners. It was basic, easy to understand, engaging, with a flawless explanation. You are a good teacher. If the input is DC, it will behave like a wire without resistance at first (for a few micro- or nanoseconds). Then after a few milliseconds or seconds, it will behave like one side has no connection to the other side. Sir, i started engg. In elecctronics.but u don’t know basics. Please send me basic electronics pdf or ebooks by mail. Very good article, I want to learn hardware design and software for arm processor to develop a project need guidance, please let me know how I can contact you. when it connected to battery.how does the electric flow? hi we need to make an ultrasonic humidifier circuit which can generate frequency of 2.4Khz. please suggest how to proceed. Very good explanation, thank you!! We have photoresistor,photodiode same like can we design photo capacitor?? I’m sure we can! But I’ve never looked into that. Sir, please can you explain how a capacitor work as a filter and as a Decoupler using circuit diagrams the way you did in transistor and LDR circuit explanations. This is a great article. It’s just so well-written. This should be mandatory for everyone to read as core-education. We have problem with AC voltage for microswitch, I preferred provide 0.022 Micro Farads non-electrolytic capacitor parallel to that switch to avoid leakage current in it. when we are measuring the voltage with respect to ground i am getting 170 VAC one pole at micro switch and nearly 50 VAC at other pole, so I am planning to provide capacitor in parallel to filter the voltage. can you tell me my idea is correct or not? Please, how can I get your free eBook? Pls, I need more explanation about; how a capacitor works when a DC current passes through it in series connection & in parallel connection. Also, when AC current does the same. Can a capacitor on an Air conditioner work some of the time and not work some of the time? On my RV, one A/C works all the time but the other 2 work some of the time. Their fans blow but the air is not cold.